In this article, Caroline Raine discusses the forthcoming changes to the transport of dangerous goods regulations. The main changes to European Agreement concerning International Carriage of Dangerous Goods by Road (ADR), International Maritime Dangerous Goods (IMDG) and International Air Transport Association (IATA) are covered but please remember to read the regulations in full rather than relying on this update. This article concentrates on the changes across the modes, Caroline will discuss the mode specific changes in Part 2 of this article. 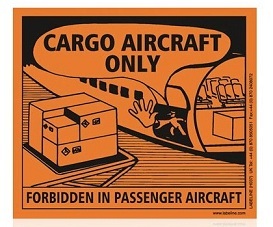 There are five modes for the transport of dangerous goods, ADR covers road transport, IMDG for sea, IATA defines the requirements for air transport, Regulations concerning the International Carriage of Dangerous Goods by Rail (RID) for rail and European Agreement concerning the International Carriage of Dangerous Goods by Inland Waterway (ADN) for inland waterways. The three most commonly used modes of transport are road, sea and air. Both ADR and IMDG are updated in a two-year cycle while IATA is updated and published annually. Throughout the transport modes the word “risk” has been changed to “hazard”, eg “subsidiary risk” is now “subsidiary hazard”. This change has been made to reflect the correct usage of the term “risk” to align to the meaning of risk in accordance with Safety Management Systems (SMS) where safety risk is defined as: “the predicted probability and severity of the consequences or outcomes of a hazard”. 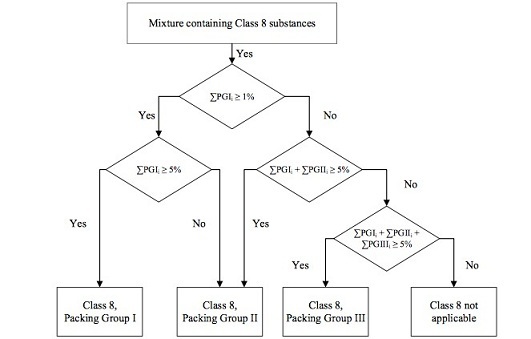 Significant changes to the provisions for the classification of corrosive substances and in particular the methods to assign packing groups to mixtures. These changes reflect the work of the UN subcommittee with the GHS subcommittee to better align the classification provisions for transport for Class 8 substances with those for supply and use. formula (PGx1/GCL) + (PGx2/SCL2) + (…) + PGxί/SCLί) ≥ 1. SCLί = specific concentration limit assigned to substance ί. The criterion for a packing group is fulfilled when the result of the calculation is ≥ 1. The generic concentration limits to be used for the evaluation in each step of the calculation method are those found in the picture. There are 12 new UN numbers, UN 3537 to UN 3548, that have been assigned to articles containing dangerous goods in Classes 2, 3, 4, 5, 8 and 9 and Division 6.1. There is also the addition of a new entry, UN 3536, lithium batteries installed in cargo transport unit (CTU). This entry is to address multimodal containers with installed lithium ion batteries, battery management systems and other electronics that function as a large fixed-base battery. Finally an addition of a new entry, UN 3535, toxic solid, flammable, inorganic, nos. 3548	articles containing miscellaneous dangerous goods, nos. For batteries being transported under SP 188 lithium battery mark must be used. See Figure 1 below. * Place for UN number(s), ie UN 3090, UN 3091, UN 3480 and/or UN 3481, as applicable. The UN number(s) indicated on the mark should be at least 12mm high. ** Place for telephone number. 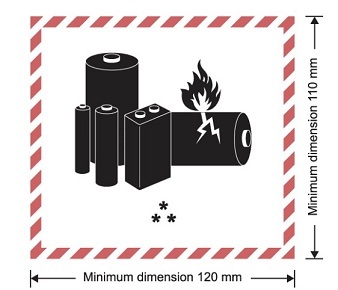 The lithium battery handling label in Figure 2 — may continue to be used until 31 December 2018 only. For lithium batteries UN 3090, UN 3091, UN 3480 and UN 3481 not meeting the provisions of SP 188 the following new label, Model No. 9A is required. See Figure 3 below. Packages bearing the Class 9 label (Model No. 9) may still be used until 31 December 2018 (ADR 1.6.1.41). Label No. 9A will not be used for the purpose for the placarding of CTUs. 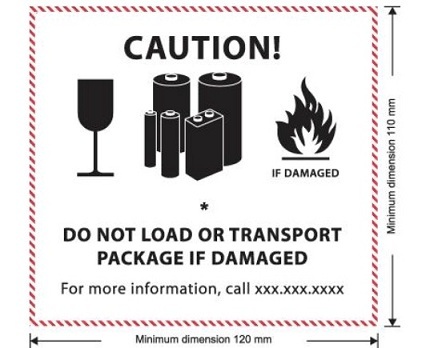 For air transport the labels used will depend on the classification of the lithium battery — and so those transporting lithium batteries should refer to the relevant packing instruction for the labelling elements. The labels and marks used in IATA are shown below in Figure 4. 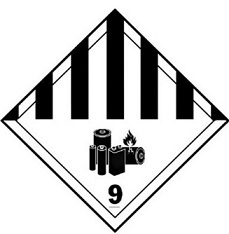 There are many changes to the modes for the transport of dangerous goods. Some of these are significant while many are editorial. If you are shipping batteries pay particular attention to the fact that the lithium battery handling mark is no longer applicable and must have been changed. This is a summary of the changes and the regulations must be referred to in full before any shipment is made. Please do contact your company’s DGSA if you require further advice.